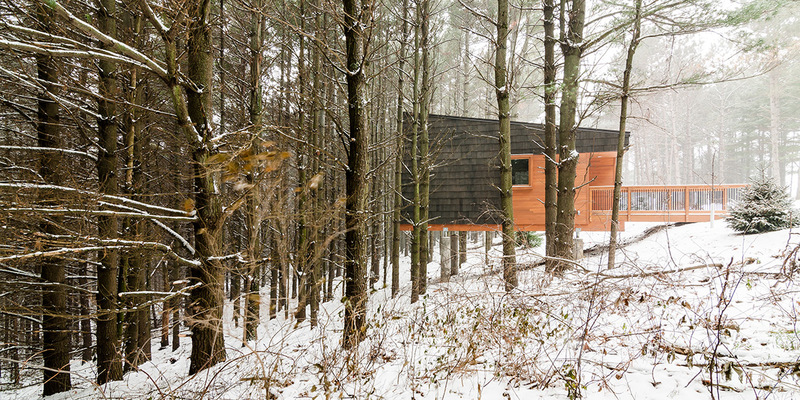 Minneapolis-based HGA has been award the 2016 American Architectural Award for series of small “houses in the trees.” Built as part of the Dakota County Parks’ 450-acre master plan, the Whitetail Woods Camper Cabins hover above the forest floor on concrete piers. The American Architectural Award is sponsored by the Chicago Athenaeum Museum of Architecture and Design and the European Centre for Architecture Art Design and urban Studies. The award, which will be presented on to HGA on October 3rd at a reception in Chicago, has been set up to promote American architecture to a global audience. Each cozy three-bed cabin is entered by a small hillside foot bridge. The 227-square-foot cedar-clad interior features two full-size beds, one sleeper sofa, and a dining and sitting area. 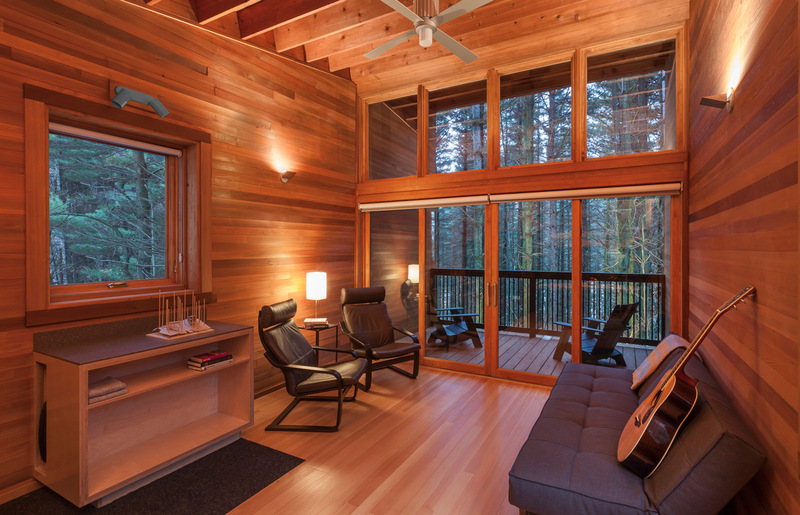 In each cabin, sliding glass doors lead out to an 80-square-foot deck for viewing nature from inside, or out. 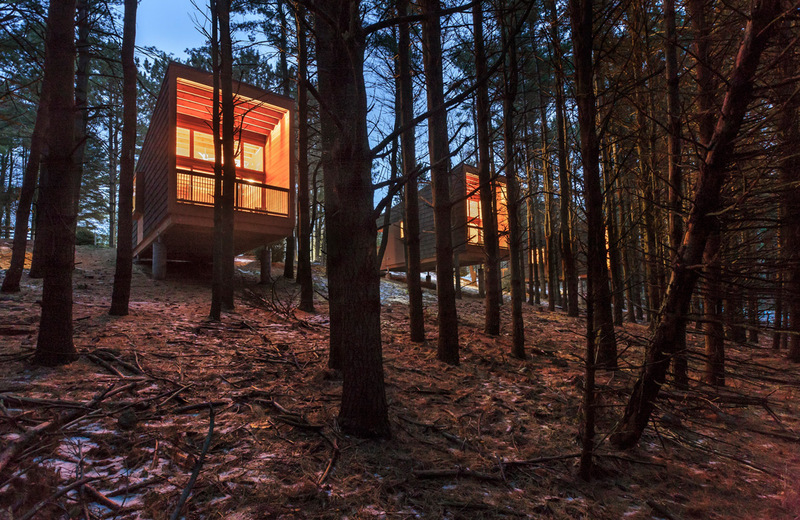 “The recreational cabins were envisioned to be unique, integrated with the wooded site, sustainable, economically affordable, and restorative for overnight guests through interaction with nature,” explained Steven Dwyer, Senior Project Designer at HGA. Along with their light touch on the forest floor, the compact cabins reduce their ecological footprint through simple sustainable design details. Natural ventilation and ceiling fans cool the cabins in the summer, while high R-value insulation helps keep them warm in the winter. By sharing restrooms and showers with the park, water consumption and waste management are also kept to a minimum. Sustainably harvested wood and non-petroleum-based finishes are used throughout the project as well. The cabins were among 74 projects chosen from a field of 380 for the award. The cabins have previously been awarded an AIA Housing Award, an AIA Minnesota Honor Award, and a Wood Design & Building Award.